As I review the calendar year so far, it is inspiring to see our relatively small team has managed to both increase the usefulness of the Kobas platform, and already managed 62% net growth in Kobas EPoS venues in just six months. With so much going on, so many daily challenges, so many corrections and lessons to learn, it is important to stop and reflect upon our overall achievements. We have expanded both our engineering and front line support teams as planned, allowing us to better support and enhance the Kobas platform. Our core support hours are 09:00-18:00 UK business days as defined in our SLA, though have always monitored requests outside of these times and taken emergency action if appropriate. We have been observing day-of-week and time-of-day trends in our support requests, and operating shift patterns within our support team to optimise our customer service. We will continue to trial unofficially extended support hours over the summer. We have noticed particular interest in evening support up until 21:00, and weekend lunchtime and afternoon cover. We hope to formalise an enhanced support offering well ahead of the busy Christmas period. Sorry to mention that mid-summer! We know how important it is to both our clients and their customers that Kobas Cloud is available and responsive at all times. Whether you are building a rota, analysing stock use, updating a menu, or whether your customers are checking their points balance and vouchers, Kobas Cloud has to be there. This availability is called “uptime”, and we strive to ensure our Kobas Cloud systems are available at least 99.99% of the time. 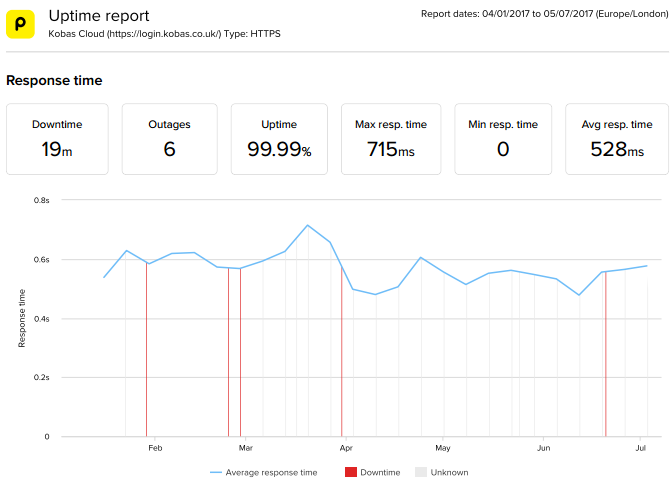 So far in 2017 we have exceeded our Cloud Platform 99.99% uptime target, as measured by a specialist third party, Pingdom. While that Pingdom report only resolves to 0.01% accuracy, a more exact score is 99.9928% uptime for the half year, and 99.9985% for the period 2017 Q2. We talk about the net growth in Kobas EPoS venues because we do see some venue closures, so any new Kobas venues have to make up that ground first. It is a sad fact that from time to time, hospitality venues are forced to close. Sometimes such closures are new concepts that haven’t worked out. Sometimes they are much more traditional venues that realised a little too late that they needed to modernise. A system like Kobas is often introduced when it becomes apparent that a hospitality venue needs to get control of its operations and cash-flow, and that tends to be a make-or-break situation. While it works out more often that not, each of those closures weighs heavy on everyone’s heart. The good news is that we are seeing exciting new concepts rising from the ashes of closed venues. A niche, focused venue may seem more risky than a generic pub, but we could well be seeing a trend where they are less risky overall. Do your homework, and you’re far more likely to end up running a destination venue that’s really got people talking. HipChips Soho – a crisps and dips café in London – powered by Kobas. Smokeshack Cleethorpes – an American style diner with its own hickory smoke pit, in Lincolnshire – powered by Kobas. Mercato Metropolitano – a shared space food and drink market on the very edge of London’s Zone 1 – not powered by Kobas, but regularly frequented by the Kobas team! Drink, Shop & Do – Café By Day, Bar By Night, Fun things to Do near King’s Cross – powered by Kobas. Like any good SaaS platform, Kobas now offers its clients more benefits than ever before. Recently, we have focused on providing greater business insights, and more asset control. Our change-log holds all the detail, but headlines are significant improvements to our stock audit and control systems, a Reservations report, and all-new EPoS bill splitting. An all-new rota builder will be the focus of our attention across the summer. We also hope to announce integrations with Preoday and Wireless Social, and some improvements to PLU price management, particularly across Price Bands.